Coventry City missed the chance to move back into the play-off places after a dour goalless draw against Swindon. Jonathan Obika had the best opportunity of a tame first period but he could not put the visitors ahead as he somehow shot wide from six yards. Home goalkeeper Reice Charles-Cook expertly kept out a curling Obika effort midway through the second half. Coventry substitute Darius Henderson nearly won it in added time but his volley was saved by Tyrell Belford. The Sky Blues, who have won just twice in 12 games, are nowe eighth, two points from a League One play-off spot. "The result is what it is. I thought it was a decent game of football. "They're a decent side on a good run of form. It was frustrating that we couldn't nick it. "We had a few chances, and a great one at the end of the game. We'll take the point and move on to the next one." 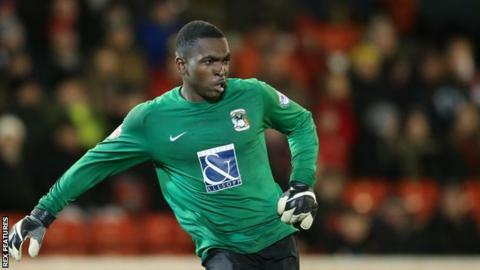 Match ends, Coventry City 0, Swindon Town 0. Second Half ends, Coventry City 0, Swindon Town 0. Corner, Coventry City. Conceded by Tyrell Belford. Attempt saved. Darius Henderson (Coventry City) right footed shot from the centre of the box is saved in the centre of the goal. Corner, Coventry City. Conceded by Jamie Sendles-White. Attempt missed. Jonathan Obika (Swindon Town) left footed shot from the centre of the box is just a bit too high. Attempt missed. Darius Henderson (Coventry City) left footed shot from outside the box misses to the left. Attempt missed. Fabien Robert (Swindon Town) right footed shot from the right side of the box is close, but misses to the right. Attempt saved. Louis Thompson (Swindon Town) right footed shot from outside the box is saved in the centre of the goal. Attempt blocked. Nicky Ajose (Swindon Town) left footed shot from the centre of the box is blocked. Foul by Sam Ricketts (Coventry City). Nicky Ajose (Swindon Town) wins a free kick in the attacking half. Delay in match Louis Thompson (Swindon Town) because of an injury. Corner, Coventry City. Conceded by Louis Thompson. Substitution, Swindon Town. James Brophy replaces Brandon Ormonde-Ottewill. Attempt missed. Fabien Robert (Swindon Town) right footed shot from the left side of the box is close, but misses to the left. Attempt blocked. James Maddison (Coventry City) left footed shot from outside the box is blocked. Attempt saved. Adam Armstrong (Coventry City) right footed shot from the left side of the box is saved in the centre of the goal. Attempt saved. Fabien Robert (Swindon Town) right footed shot from outside the box is saved in the centre of the goal. Substitution, Swindon Town. Fabien Robert replaces Anton Rodgers. Substitution, Coventry City. Darius Henderson replaces Martin Lorentzson because of an injury. Bradley Barry (Swindon Town) wins a free kick in the attacking half. Foul by Adam Armstrong (Coventry City). Jordan Turnbull (Swindon Town) wins a free kick on the right wing. James Maddison (Coventry City) wins a free kick in the attacking half. Attempt blocked. John Fleck (Coventry City) left footed shot from outside the box is blocked. Attempt missed. Sam Ricketts (Coventry City) header from the centre of the box is close, but misses the top right corner. Attempt blocked. Jacob Murphy (Coventry City) right footed shot from outside the box is blocked. Foul by Jamie Sendles-White (Swindon Town). Foul by Brandon Ormonde-Ottewill (Swindon Town).